The Storm worm gang is at it again. Their current spam run directs recipients to a site hosting their malicious download. If you open the site, you'll be prompted to download the file after five seconds. It's a rerun of the Valentine's Day theme with new subject lines such as "Love Rose", "Rockin' Valentine", and "Just You". 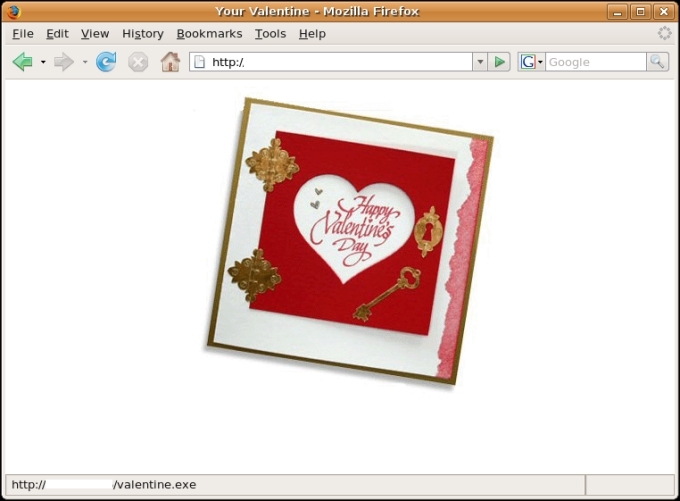 The Web site produces random images with each visit and then let's not forget the filename — valentine.exe. Less than a month ago, we saw the first run and now that Cupid is preparing his bow for Valentine's Day, they have resumed their campaign. They'll keep on doing it as long as people keep falling for it. As we blog, we detect this as Email-Worm:W32/Zhelatin.TQ. So be sure to keep your virus definitions up to date, your computer patched, and don't be part of the Storm botnet this Valentine's Day. We'll keep an eye on their next move.